Generally speaking, genetic testing implies direct examination of the DNA (or the associated RNA or protein) of a gene related with a specific disorder. Overall, the testing is usually done to confirm a diagnosis of a particular disease, or to foresee the occurrence of a genetic disorder for which symptoms haven’t even showed up. Molecular genetic tests (more popular a s “gene tests”) aim to identify variations or other mutations within the DNA of single genes or other related short lengths DNA regions. The identified alterations of the genetic material might be associated with a particular genetic disorder. The focus of chromosomal genetic tests is the analysis of large genetic changes concerning long lengths of DNA or even whole chromosomes. This includes insertions, deletions, duplication of chromosome sequences and detection of extra copy of a chromosome. Biochemical genetic tests examine the levels of expression (protein production) or changes in the activity of proteins. Any detected changes could suggest possible changes in the corresponding DNA , which can result in a genetic disorder. Predictive testing: Predictive (or presymptomatic) genetic testing is used to identify mutations in genes associated with disorders that might appear late after birth. These tests are highly recommended in case that the person does not show any features of the disorder, but have a family member with the genetic disorder. This type of genetic testing can identify genetic alterations that increase the chances of developing of specific disorders like certain types of cancer. Predictive testing can identify person will a genetic disorder, before any symptoms of the disorder to appear – an example is the testing for hemochromatosis, which is an iron overload disorder. Diagnostic testing – this type of genetic identify specific genetic (or chromosomal) condition. Sometimes it is required to confirm a diagnosis which was assigned based on particular symptoms and then the diagnostic testing comes in place. This type of testing can be performed at any time, when it is necessary, during a person’s life. However, currently there are no diagnostic tests for all genes and genetic conditions. Prenatal diagnosis is used to identify gene or chromosome changes in a fetus. Prenatal diagnose is almost mandatory for couples with an elevated risk of having offspring with a genetic disorder, cause by gene mutation or chromosomal aberration. Prenatal testing lessen parents uncertainty and help them decide to abort or not the pregnancy in an early embryonic phase. Unfortunately, the current prenatal diagnostic tests cannot identify all possible birth defects and inherited disorders. Newborn screening is applied right after birth and aims to identify genetic disorders, which might be possible to be treated early in life. Nowadays, the newborn screening is a routine testing for all infants in some countries – in USA all new borne babies are tested for certain disorders like phenylketonuria ( if left untreated, cause mental illness) and congenital hypothyroidism (thyroid gland malfunctioning). Parental (and genealogy) testing: This type of genetic testing identifies specific regions of DNA (called genetic markers or DNA markers), which are used to identify related individuals, based on the same or similar inheritance patterns of the genetic markers. Each of these markers can be traced back to the parental lines, because we all inherit half of our genetic material from the father, and half from the mother. Thus, based on the lineage of marker, the geneticists can draw the conclusion of relatedness between individuals and further to determine ancestry or ethnic heritage for genealogy reconstruction. 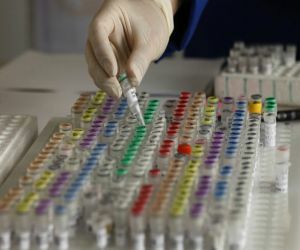 Forensic testing uses genetic material in order to identify an individual for legal purposes.The aim of the forensic genetic testing is not to detect gene mutations related with disease, but to identify uniquely an individual – a crime or catastrophe victims or a crime suspect. Genetic testing has both benefits as well as some limitations and possible risks. Before making any the decision it is highly recommended to meet with geneticist or genetic counselor who can explain you in details what is genetic testing and can provide you with expert opinion about the pros and cons of these procedures.